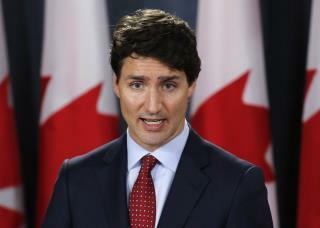 (Newser) – Justin Trudeau says he was ready to fly to Washington to make a deal on NAFTA—until Mike Pence made a demand that he had no choice but to reject. The Canadian prime minister says the vice president told him there would have to be a "sunset clause" guaranteeing that the deal would expire in five years, the Washington Post reports. Trudeau says this would create far too much uncertainty for businesses. He says the visit was called off after he made it clear to Pence that no Canadian leader would sign a deal containing a sunset clause. Trump said in a statement Thursday that the US "has been taken advantage of for many decades on trade" and the message was conveyed to Trudeau that Washington will "agree to a fair deal, or there will be no deal at all." "FAIR TRADE!" he tweeted. Put America First.. . Isn't that Trumps moto? The same thing that Trump denouces about other countries he actually wants to do. Its hyproctical to get mad at another country for doing what you can't do. I am born and raised in TX, but at the same time I am educated and can do my own research to know that the US does not make anything in this country anymore. How about making and producing goods in the U.S and you wouldn't have to rely on other countries for: aluminum /steel/Textiles and etc. Trump is trying to demand instead of negotiate. Trumps ties and suits are made overseas. Let's put 34% tariffs on textiles and see how long that last. Right now people may applaud the tariffs ,but once those cost are past along to the consumer (manufactures will not eat the cost), people will then start to recognize the danger of Tariffs. hey Trudeau How are the irregulars doing in your country??? ha ha ha "irregulars"
Socialist countries whose governments prop up their businesses would not want a "sunset clause." They want their unfair advantage to go on and on, indefinitely. It's time our trade deals be about us - and not about them.